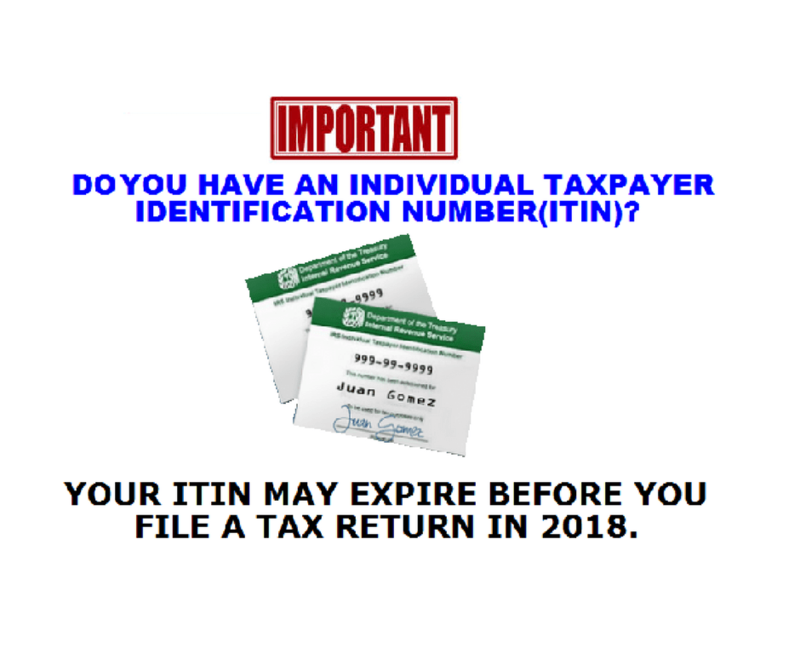 The Internal Revenue Service reminds taxpayers with expiring Individual Taxpayer Identification Numbers (ITIN) to submit their renewal applications as soon as possible. Failing to renew them by the end of the year will cause refund and processing delays in 2018. Taxpayers whose ITIN is expiring and who need to file a tax return in 2018 must submit a renewal application. Others do not need to take any action. ITINs with the middle digits 70, 71, 72, or 80 (For example: 9NN-70-NNNN; NNN-71-NNNN; 9NN-72-NNNN; 9NN-80-NNNN) need to be renewed even if the taxpayer has used it in the last three years. The IRS will begin sending the CP-48 Notice, You must renew your Individual Taxpayer Identification Number (ITIN) to file your U.S. tax return, later this summer to affected taxpayers. The notice explains the steps to take to renew the ITIN if it will be included on a U.S. tax return filed in 2018. Taxpayers who receive the notice after taking action to renew their ITIN do not need to take further action unless another family member is affected. Taxpayers can also renew their ITINs with middle digits 78 and 79 that have already expired. Taxpayers with an ITIN with middle digits 70, 71, 72 or 80 have the option to renew ITINs for their entire family at the same time. Those who have received a renewal letter from the IRS can choose to renew the family’s ITINs together even if family members have an ITIN with middle digits other than 70, 71, 72 or 80. Family members include the tax filer, spouse, and any dependents claimed on the tax return. Taxpayers have the option to work with Certified Acceptance Agents (CAAs) authorized by the IRS to help them apply for an ITIN. CAAs can certify all identification documents for primary and secondary taxpayers and certify that an ITIN application is correct before submitting it to the IRS for processing. A CAA can also certify passports and birth certificates for dependents. This saves taxpayers from mailing original documents to the IRS. In advance, taxpayers can call and make an appointment at a designated IRS Taxpayer Assistance Center instead of mailing original identification documents to the IRS. Federal returns that are submitted in 2018 with an expired ITIN will be processed. However, exemptions and/or certain tax credits will be disallowed. Taxpayers will receive a notice in the mail advising them of the change to their tax return and their need to renew their ITIN. Once the ITIN is renewed, any applicable exemptions and credits will be restored and any refunds will be issued. Additionally, several common errors can slow down and hold some ITIN renewal applications. The mistakes generally center on missing information and/or insufficient supporting documentation. The IRS urges any applicant to check over their form carefully before sending it to the IRS.